The Trilogy Magnesium formula can be used to promote relaxation, fight the effects of stress and improve restful sleep. 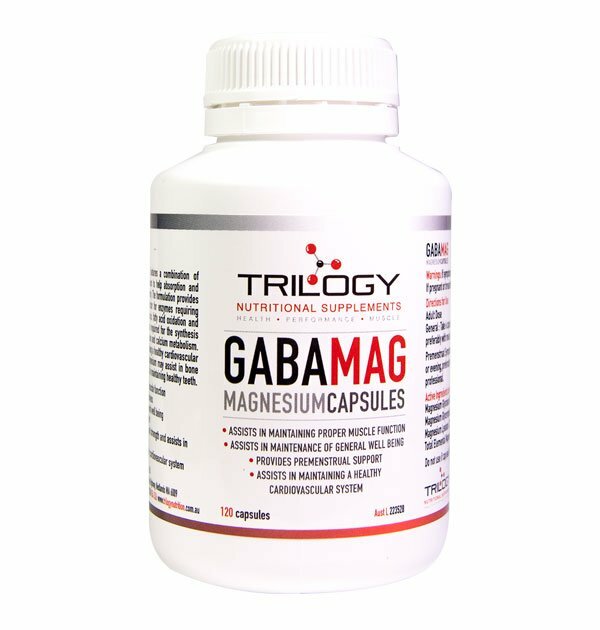 GABAMAG is our high quality Magnesium supplement. Our Magnesium formula can be used to promote relaxation, fight the effects of stress and improve restful sleep. Our special Magnesium formula features a combination of three different form of magnesium to help absorption and utilisation of magnesium in the body. As well as fighting the effects of stress, the benefits of a Magnesium supplement extend to helping with depression, reducing the risk of developing hypertension and reducing migraines. Magnesium can also boost your exercise performance by aiding in the creating of proteins and it helps move blood sugar into your muscles and dispose of lactic acid. The formulation provides magnesium an essential cofactor for enzymes requiring ATP (these are involved in glycolysis, fatty acid oxidation and amino acid metabolism). It is also required for the synthesis of RNA and replication of DNA; neuromuscular transmission and calcium metabolism. Magnesium may assist in maintaining a health cardiovascular system in healthy individuals. Magnesium may assist in bone formation and strength and assists in maintaining healthy teeth. Aids or assists in the prevention of muscular cramps and spasms. Helps relieve nervous tension – stress and mild anxiety.